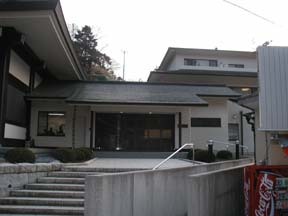 Temple Lodging in Japan "Seityo-ji"
Access "JR Awaamatsu station" > (bus) > "Seityo-ji bus stop"
Nichiren, a founder of the Nichiren sect performed ascetic practices in this temple. In the precinct, there are huge 47 m cedars and Hosei Pond, home to forest green tree frogs live, as well as Sanroden (the former shukubo), which has a "fire preventive ox" transom that is said to have been made by a famous sculptor, Jingoro Hidari. 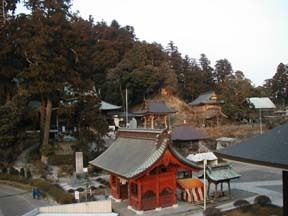 Also the forest where Nichiren expressed his intention of starting a new Buddhist sect is famous as the location (other than isolated islands) where the sun rises the earliest on Jan. 1. I hear that many guests stay in the shukubo on this day. 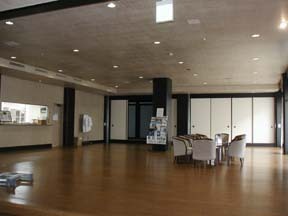 Although the shukubo's building is modern reinforced concrete construction, it is located inside the precinct and commands a view of the main hall. So, I was able to fully enjoy the religious atmosphere. 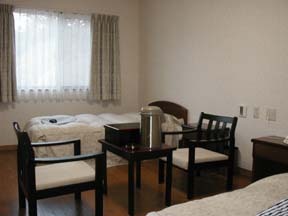 The room was very clean and comfortable and was well equipped like a private inn with a yukata robe and warm tea. However, a towel and a toothbrush were not provided. 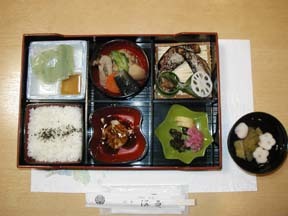 A box in which forest green tree frogs were raised was placed in front of the reception counter and so I was glad to see the precious creatures designated as a protected species.�@Also, I was impressed by the exquisite taste of each dish. 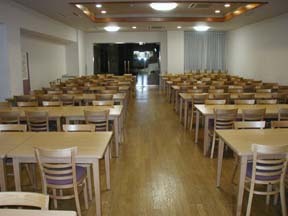 The service in the morning is conducted in the main hall and the Soshido hall. In the main hall, an image of Kyokuzo-Bosatsu (Bodhisattva), which is considered as one of Japan's three masterpieces of Bosatsu images, is open to the public and only those who participated in the service can worship this image. After purification by flints, the image of Bosatsu looms up in the back of the dark housing, which is a truly mysterious scene. This Bosatsu is referred to as the Buddha of Wisdom and Nichiren-Shonin made his ardent prayer "to be the wisest in Japan," but the face of the Buddha was soft and mild to the contrary. 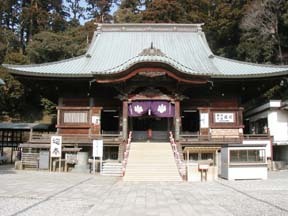 In the service, prayers for the purification of the sins of the guests staying at the shukubo, health, the realization of the wishes and the avoidance of evil are offered. 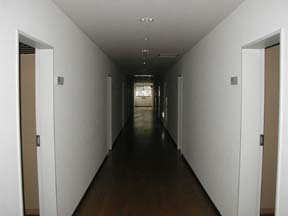 If you go to the Soshido Hall, you will receive phrases consoling the souls of your ancestors. After the service, you will be recommended to go into the forest to see the rising sun. When I checked-in at the shukubo, they told me the time of sunrise. Unfortunately the day I stayed there, it was cloudy. On a fine day, however, you may feel as if you can hear the voice of Nichiren-Shonin expressing the title for the opening of his sect. The priest was a very friendly person and he talked to me after the service. I was the only person who stayed at the shukubo on this day, but the shukubo staff all welcomed me with pleasure and I had a very good time. I hear that other people who have stayed have also enjoyed sharing time with people in the temple. Some said they learned how to use juzu (a sort of rosary) from the priest.